Burbank, CA – John Corcoran, one of the most influential individuals in the martial arts industry, was proud to support the Martial Arts History Museum this month by becoming a major sponsor. 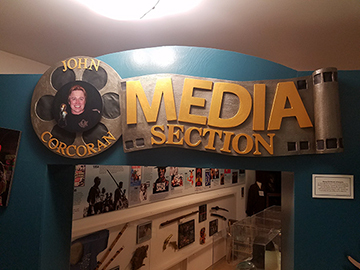 The Media Section, our most popular area of the museum, will appropriately be named after Corcoran as well as his likeness will be display. “This is a very exciting thing for the museum. This is the first time we have opened 'section sponsorship' for the museum. As a non-profit, we are fully dependent on sponsorships, donations and visitation. Having such a dynamic and history-making individual to be our first sponsor is just amazing,” says museum president Michael Matsuda. Corcoran, inducted into the Martial Arts History Museum in 2004 as the “Funakoshi Award” winner, has been the editor of every major martial arts magazine in the world. Author of a variety of historical publications, he is also the co-author of the highly acclaimed Martial Arts Encyclopedia. The Media Section is filled with tributes to martial arts history in film, television and martial arts publications. It also contains a variety of movie props, an historical film/tv timeline and a small theater highlighting the impact of martial arts on film. “I am honored to be the first one sponsoring a major section in the museum. I know this will generate more interest to become sponsors as well,” says Corcoran. Now on permanent display at the entrance of the Media Section, a unique, “Disney style” sculpture was designed by former Walt Disney Studio artist Michael Matsuda and Halloween designer, Bill Webber. “The museum brings in a lot of kids through outr tours and I felt we needed to design something that was unique and beautiful. I think we accomplished that and it's very exciting for us,” adds Matsuda. For information on become a section sponsor or to make a donation to the Martial Arts History Museum, please visit their website at Mamuseum.com or call (818) 478-1722.